For emerging markets (EMs), 2017 represented a year of disinflationary surprises. However, in recent months this trend has dissipated and if anything inflation began surprising more positively at the margin (see Figure 1). 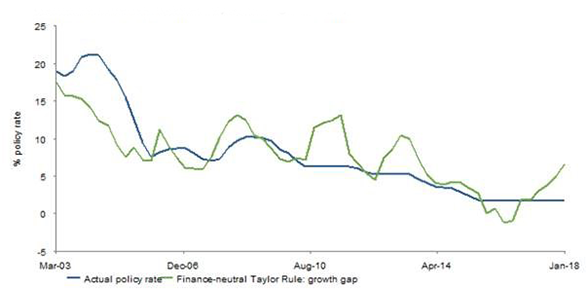 This supported our decision to stay fairly neutral on local currency bonds over the last few months. We think overall inflation will likely see less downside momentum, although analysing the investment universe on a country-by-country basis tells a much more interesting story. Even in countries where inflation is likely to pick up, the reasons for the inflationary momentum are largely idiosyncratic, ranging from a combination of base effects, pass-through from oil prices, to excessively loose monetary policy and a reduction in spare capacity in some economies. At the same time, in some markets we expect disinflationary momentum in 2018, and risks for the asset class remain fairly benign with very few EM economies close to overheating. Thus from a bottom-up perspective, diverging inflationary trends are providing a constructive alpha generating environment. The rise in oil prices has led to some pass-through inflation in a number of net oil-importing countries. 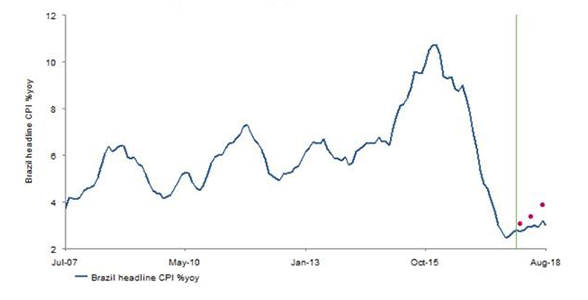 For example, Indian fuel inflation hit nearly 8% in November, the highest since 2013. Similarly, food inflation rose significantly, and core inflation has also started ticking modestly higher. This will likely force the Reserve Bank of India to commence an interest rate hiking cycle in the first few months of 2018, and therefore we prefer to play from the short side. The pick-up in inflation also reflects the cyclical bounce beginning to reduce slack in some EM economies. In recent years, tight labour conditions failed to generate inflation in the Central and Eastern European (CEE) region, but this may finally be beginning to change. Czech growth may have only pushed up core inflation towards 2%, but this represents a multi-year high, and has encouraged the Czech National Bank to start its hiking cycle. This keeps us generally bearish on local bonds and rates, while we are more positive in FX. Hungary also experienced a surge in core inflation this year, although headline inflation will likely remain below target for 2018, and given the central bank’s commitment to flattening the yield curve we continue to like longer-maturing local bonds. In contrast to the Czech Republic, the Romanian central bank has been somewhat behind the curve, as our basic Taylor rule suggests (Figure 2), with inflation rising above target for the first time in four years. To date, the central bank’s attempts to control inflation by narrowing the interest rate corridor seem inadequate, with headline inflation surprising higher to 3.2% in November. This should finally encourage the central bank to raise interest rates in early 2018. The lack of central bank credibility in Turkey has allowed core inflation (12%) and inflation expectations (9.3%) to hit 13-year highs. December’s rate tightening underwhelmed market expectations, and it’s likely that the FX pass-through from the weak lira will force the central bank into aggressively hiking rates in the early months of 2018. 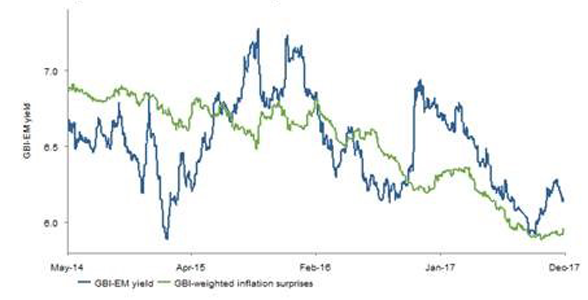 Two markets in particular – Brazil and Russia – epitomised the disinflationary momentum over the last 18 months. Nevertheless central banks in both countries showed unprecedented restraint by only gradually lowering interest rates, therefore helping anchor inflationary expectations. This succeeded in both countries, with inflation rates moving from double digits in 2016 to below 3% now, and below or within their central bank’s targets. Naturally this trend is now beginning to slow and we should see a modest pick-up in inflation through the first half of 2018 (Figure 3). We don’t find Brazilian local bonds particularly appealing at these levels. While we’ve been positive on Russia for most of 2017 we’re more bearish now, despite the central bank surprising markets with a dovish cut in December. We currently feel less optimistic for future interest rate cuts, with base effects creeping into inflation numbers and valuations looking somewhat stretched. Given the cyclical pick-up in economic growth and external account dynamics in both markets, we are more constructive on currencies than bonds for now. There are other markets, particularly in Latin America, where we still see material room for inflation to fall through the coming months. Argentina remains the most extreme example, with inflation still close to 25% and the central bank keeping rates very high to try and push down inflation expectations. While we think they will eventually manage to succeed in doing this, it will inevitably take time. Given the extent of the yield curve inversion, the risk reward pay-off is much more attractive in T-bills where we can still pick up a yield of close to 30%. Nowcasting: Econometric modelling is inherently imperfect and not a reliable indicator of future results. Source: Haver, Bloomberg, Investec Asset Management calculations December 2017 Nowcasting models are used to predict short-term economic dynamics. Nowcasting estimates are based on our proprietary dynamic factor models using third party data. These models are only utilised as part of the team's wider investment analysis. In Mexico, Banxico retained its hawkish bias, delivering a cumulative 150 basis point hike this year in a bid to suppress inflation expectations. 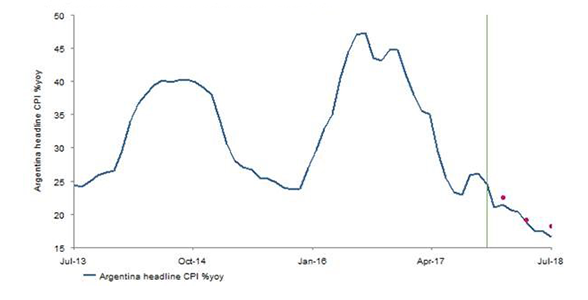 Our nowcast points to a tick down in inflation during the first half of this year and while longer-dated bonds may come under pressure from political news, we maintain a constructive view on the mid-part of the curve. We also remain constructive on Peruvian local bonds, due partly to our views on inflation. Lacklustre growth is having some downward pressure on pricing pressures, allowing the central bank to lower interest rates. Outside of Latin America, South Africa represents another market which should experience some disinflationary momentum this year, which we expect the central bank to recognise by cutting rates during the first quarter of this year. This, combined with the market pleasing ANC election outcome, keeps us positive on the country’s bonds going into 2018.